Uric acid is a product of purine breakdown. Purines are aromatic organic compounds found in certain foods and beverages. Medline Medical Encyclopedia states that a significant amount of uric acid in your body dissolves in your blood and is excreted in your urine, but if your body produces too much uric acid or is unable to rid itself of uric acid, you can develop a condition known as hyperuricemia. Ask your doctor if supplements can help resolve your hyperuricemia. There are many possible causes of a high uric acid level in your body, states MayoClinic.com, including genetics, consuming too many purine- or caffeine-rich foods, drinking too much alcohol, being obese, using diuretic and immune-suppressing medications and having certain diseases or illnesses, such as Hodgkin's lymphoma, non-Hodgkin's lymphoma, underactive thyroid and psoriasis. In some cases, elevated uric acid levels can lead to kidney stones, kidney failure and gout, and also might be associated with hypertension and heart disease. 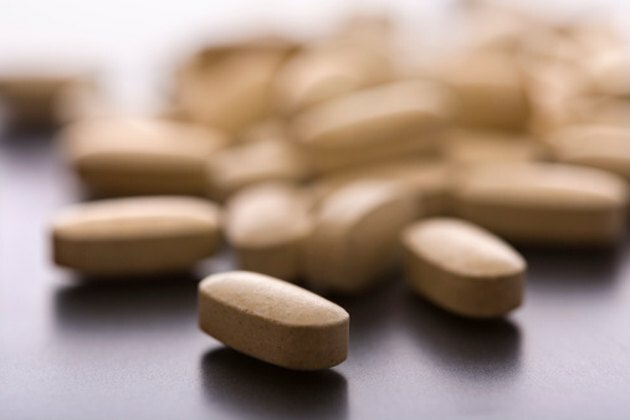 Certain dietary supplements might be beneficial in lowering uric acid levels in your body, but not all supplements used for this purpose are backed by extensive scientific research studies. Some of the most effective supplements in lowering your uric acid levels include vitamin C with bioflavonoids, free-form amino acids, kelp, alfalfa and vitamins A and E, notes Phyllis A. Balch, a certified nutritional consultant and author of "Prescription for Nutritional Healing." Alfalfa might be one of the most helpful nutritional supplements for lowering your body's uric acid levels. Dr. Sharol Tilgner, a naturopathic physician and author of "Herbal Medicine From the Heart of the Earth," says alfalfa contains numerous vitamins, minerals and proteins. Some of these minerals, along with other nutrients in alfalfa, might help lower your serum, or blood, uric acid levels. Balch recommends a dosage of 2,000 to 3,000 mg of alfalfa per day for this purpose. Always discuss proper dosage with your doctor before using supplements to treat your ailment. Because there are several possible causes of elevated uric acid levels in your blood, it is important to discuss all possible treatment scenarios with your doctor. Your physician can counsel you on the most relevant and effective treatment measures to help resolve your health problem, and can inform you about the potential risks and side effects associated with natural treatment methods, such as dietary supplementation. Not all supplements might be right for you and your condition. What Supplements Are Good for Water Retention?